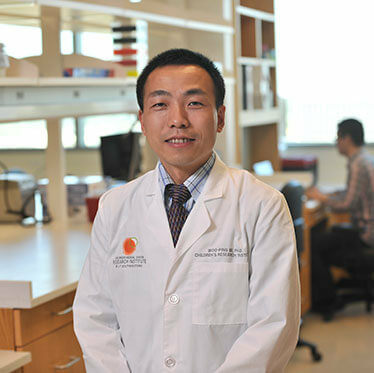 Q&A with Woo-Ping Ge, Ph.D.
Children’s Research Institute at UT Southwestern (CRI) has recruited a new faculty member, Woo-Ping Ge, Ph.D. His laboratory will research the interactions between brain vasculature and the nervous system, in hopes of developing therapeutic targets for treating diseases such as stroke and brain tumors. Dr. Ge recently shared his thoughts about joining CRI and the impact he expects his new surroundings will have on his work. What appealed to you as you were considering joining the Children’s Research Institute at UT Southwestern? My background is in neuroscience, but through my postdoctoral studies I became very interested in pursuing research related to blood vessels in the brain, or brain vasculature. When I decided to seek opportunities to advance my career and my research on brain vasculature, I interviewed at several universities, but it was at the Children’s Research Institute at UT Southwestern that I sensed a real appreciation for the work I wanted to pursue. At CRI, there is a very welcoming attitude about my seeking to connect neuroscience with cardiovascular research, even though I didn’t have much experience or any published work in cardiovascular research. I am very confident about the bridging of those two areas of research, especially in light of the support from CRI. Another aspect of CRI that I appreciate very much, especially as someone setting up their own lab for the first time, is the administrative support provided here. Having a system in place in which all of the administrative aspects are streamlined and efficient means more of my time can be dedicated to research. There also is a unique history at UT Southwestern in terms of collaboration, about which I heard so many good things. The culture here at CRI and UT Southwestern is different than a lot of other top academic research and medical centers. I look forward to working with Sean [Morrison], Ralph [DeBerardinis] and Hao [Zhu], because the work I am doing and the work they are doing can interconnect in so many ways; certainly to the benefit of my research, but also I hope to the benefit of their research as well. The fact that their areas of research are different than mine is also good, because I truly believe we can learn more from people outside our own field of research. Describe what your research at CRI will be targeting? Much of my research at the beginning will focus on better understanding the basics of the interaction in the brain among different kinds of cells, specifically neuron-blood vessel interaction and glial cell-blood vessel interaction. I want to understand more about how neurons and glial cells interact with blood vessels under pathological conditions including strokes, how that interaction may relate to the occurrence of strokes, and what treatments might be found that can repair the resulting damaged tissue and neural networks. I also am interested in researching how glial cell generation may be linked to the development of brain tumors. Why did you decide to become a biomedical research scientist? My uncle was a zoologist who studied and worked at the Chinese Academy of Sciences to help control and combat agricultural pests. My parents are peasants, and I heard a lot from them about my uncle when I was growing up in a rural village. That led to my interest in biology, which I pursued in college. When I was a senior in college at East China Normal University (ECNU), the Institute of Neuroscience opened in China. At that same time I also heard about how a famous neuroscientist, Joe Tsien — also an alumnus of the biology department at ECNU — had been able to create a smarter mouse by the genetic manipulation of a single gene. So, when the time came to pursue my graduate degree, I knew I wanted to study the brain because there are so many challenging questions and opportunities for advancing what we know. That remains my passion to this day.